I have created a northern China girl wearing a traditional Henan’s Opera headdress looking directly to the camera. 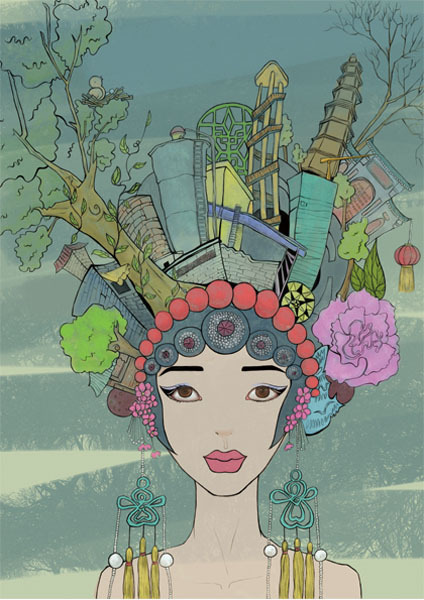 Her headdress is formed by a lot of local famous landmarks and buildings of Henan city, including the Shaolin Monastery, millionaire Kang’s garden and the Steel factory. The reason I put both traditional and modern elements together in the picture is because I wanted to remain people the importance of keeping our tradition culture and ancient spirit in our mind while our city is growing rapidly nowadays. In doing so, I hope the beauty of Henan can go on shining in the future.